On November 6, 1965, President Lyndon Johnson accepted a report from the President’s Science Advisory Committee on Pollution, of Air, Soil and Waters. The committee had set off alarms with regard to what would later be known as climate change. In its report, the committee highlighted what we now understand as one of the base problems associated with climate change. Millions of dollars and years of research since have given us a clearer picture of the problem, though research has not clarified the precise impact of climate change to human and ecological systems. The health security impact of climate change will be determined not necessarily by the natural systems that generate exposure to risk, but rather by the ability of social and political systems to respond rapidly enough to minimize climate-related health impacts as well as react to new risks. While significant work has been done examining the social vulnerability of populations to climate changes, perhaps a better conceptualization of the problem is to examine the vulnerability of the various political and policy systems and conditions to be able to respond adequately. Research, reviews, opinion, and commentary are welcome from a wide variety of disciplinary backgrounds including risk analysis, climate sciences, public health, the social and behavioral sciences, political science and international relations, civil society organizations, and government agencies. It is possible that papers could also be considered for submission as panels at the ISA 2020 conference in Hawaii. We welcome submissions from researchers at all career stages, including graduate students engaged in climate change and health research. 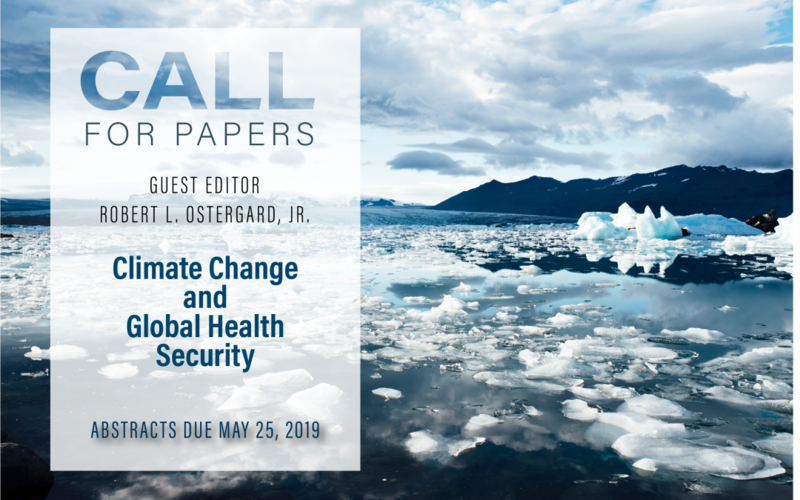 Researchers interested in contributing to the special issue must submit a 250-word abstract to Global Health Governance (ghgovernance@gmail.com) and CC the Managing Editor Courtney Tan (courtneypagetan@gmail.com) by May 25 with the subject line “Abstract submission: Climate Change and Global Health Security.” If you are interested in submitting the paper for a panel at ISA 2020, please also send the abstract directly to the guest editor (Robert Ostergard, orobert@unr.edu). The guest editor will review abstracts and make decisions for the special edition by June 30. Researchers whose abstracts are accepted will be invited to submit full manuscripts (5000-7500 word research articles, 3000-4000 word review articles, or 1,000-2,000 word commentaries) due by December 15, 2019. Manuscripts will be internally reviewed and sent for peer review. Authors will be notified of peer review decisions by March 1. Revisions, if needed, will be due by April 1 with the goal of publication in May of 2020. A climate change and health security panel proposal will be submitted for the ISA Hawaii conference by the submission deadline, which is usually in June. Questions and suggestions can be sent to the guest editor (orobert@unr.edu). More information about Global Health Governance style and formatting can be found at the Journal website: www.ghgj.org. Thank you for your interest in this special issue.